Every once in a while, I feel compelled to write hard things—unpopular things. Things that may rock the boat a little. God has been speaking into my heart about this very topic over the past year, and I feel now is the time to share it with you. My hope is to open your eyes and give you sure-footing, especially in these coming times. The stakes are too high. 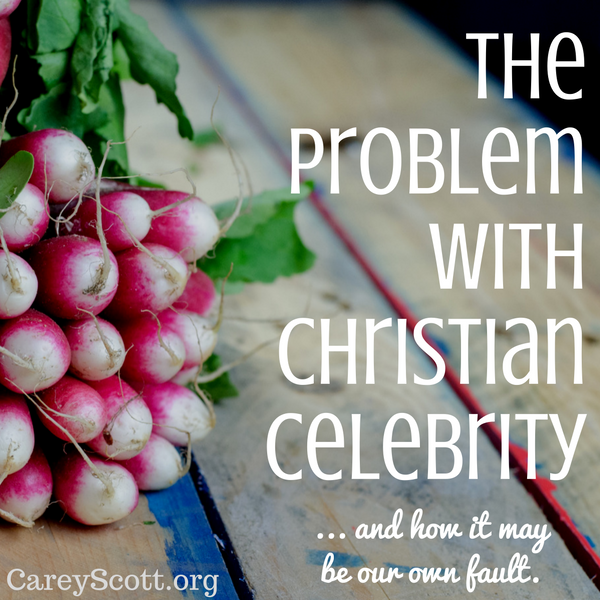 The truth is… I’m a little unsettled with the trend of Christian celebrity. I know we each have a different calling on our life, and some are called to stand before us as leaders. But our response to them feels out of balance. It seems we’ve starting worshiping them. … Have you decided to follow someone, deciding everything they do is gold? … Do you hang on their every word, blindly believing all they say as Truth? … Do you replace time in the Word with time on a certain someone’s social media accounts? … Are you being fed through someone else’s divinely-inspired revelation rather than asking God for your own? … Do someone’s clever sayings and memes move you more than the movement of the Holy Spirit? … Are you too busy quoting her rather than quoting Him? Honestly, I think there are some amazing leaders out there doing a bang-up job of shining a light on Jesus. Even when they are promoting their work, it’s all for His glory. I appreciate their humility. I respect their insights and the challenges they issue for us to walk out our faith with purpose, and I listen to what they have to say. Done right, these leaders understand they are serving God. Paul sure did. His identity rested in it. Romans 1:1 says… “Paul, a servant of Christ Jesus”. Philippians 1:1 says… “Paul and Timothy, servants of Christ Jesus”, and Titus 1:1 says… “Paul, a servant of God”. Each of us will choose someone or something to serve. I’ve sat under women teachers who take this call seriously and promote Him beautifully. But there are others twisting the Word to fit their new narrative. Some have allowed fame to cloud their judgement, and their motives are more about them than… Him. Many have become over-sharers because we’ve become over-consumers. And some have compromised what they know is right to get what they want—even at the expense of others. Maybe it’s our unrelenting adoration that fuels them. … We hang on their every word on from politics to prayer. … We sacrifice time with our family to follow their every move on social media. … We gush when we see them in person. … We tag them in posts, hoping they’ll notice us. Maybe we’ve become too interested. And maybe—just maybe—we are the ones doing them an injustice. Because somewhere along the way we’ve decided their words are as powerful as Jesus’. We’ve replaced time in the Word with time in their books. We’ve allowed their interpretation of the Word to become ours (often without even verifying it for ourselves). And it seems we’ve elevated them to a god-like status. I’ve been guilty. Some of these leaders are witty, deep, and look flawless. But for us to think they have elite status with God is completely inaccurate. For us to think they teeter on the edge of perfection is wrong. And worshiping them is dangerous. They are unfit substitutes for God Himself. And while listening to leaders share their testimonies can remind us that God is alive and active… while He can use their words to soften our heart to Him… while their insight can unlock truths in our lives… they can’t replace God. And they are not worthy of our… worship. While many of these leaders have powerful words to share, nothing—no thing or no one—should replace the Word of God in your life. Those leaders we’ve given celebrity status are no better than you or me. Just like everyone, you have full access to His Truth. And if you ask the Holy Spirit to help, you’ll be able to read and understand scripture for yourself. You’ll create your own personal connection to God rather than cling to every word she speaks or writes. 1) When we consider pastors, speakers or authors infallible, we’re telling God He has an equal. He does not. 2) God is a jealous God. It doesn’t mean He is envious of someone who has something He wants. It means He is jealous when we give others what rightly belongs to Him. God is possessive of the adoration and worship that should be His… alone. 3) Sometimes our adoration gives leaders a false sense of importance. Instead, let’s commit to pray for the integrity of their ministries. We can respect the call God has placed on the lives of Christian leaders, but we cannot worship them. We can be blessed by their words, but we can’t substitute them for God’s Word. And we can follow them on social media, but we cannot give them a status above Jesus. Because He is incomparable and unequal. Period. Hi Gloria! Thank you for taking the time to read my words and reach out to me. I’m not sure what you’re asking, though. 🙂 Can you clarify your question because I’d love to answer! Great to hear from you, Laura! All I can say is “yes!” So appreciated this post. We must indeed be women of the Word and test every word against Scripture. You’ve written great words of caution to live by here. Blessings!